"Happy New Year" to you all. I know I am late for that greeting, but this is the first ezine for 2010. I hope you had a really good Christmas, whether it was in the cold, snowy weather or the heat. As I look out of my window now the snow is lingering around here in England, and it is cold...Brrrr! My central heating is working over time. Did you get what was on your Christmas Wish list? No matter how big or small. 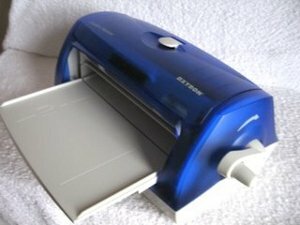 Xyron Creative Station to help with my glueing needs. And since it arrived in my craftroom it has been put to good use. So "Thank You" hubby for another fabulous gift. There are many many more ways to get your card and paper to connect. Just experiment with the different adhesives until you find the ones you prefer. I have been busy on my Website to bring you more great videos, projects and ideas for you to try. 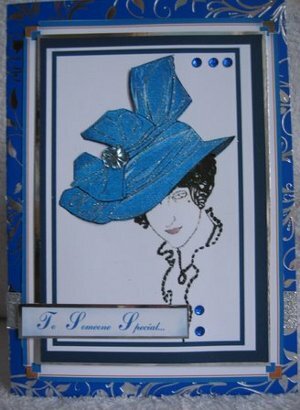 Art Deco Cards to highlight the "Age of Glamour" have been added to the pages. They are from a really glitzy, bygone era. There are some different, but easy to do folds with a new video to show you how. 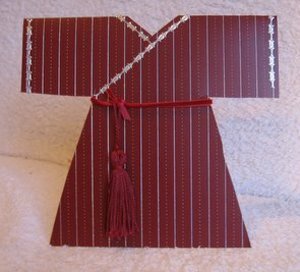 There is nothing worse than buying a box of blank A4 card and then wondering where to start, with out using the same fold over and over again. 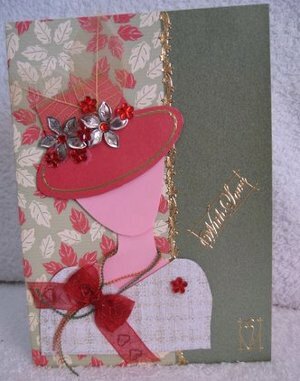 Here you will find some really good ideas to help you decide how to fold that blank card, to give some fabulous results. Then how you dress it up is covered by the other pages on the website. 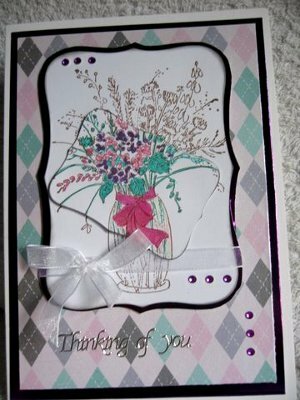 Add some flowers, whether handmade or punched, and there are more short video tutorials to help you. ...are all easy to do. and this project shows you how to get this result. Now that the jolly season is out of the way we can think of spring and summer themes and add lots of flowers and "Bling"
Your options are endless...just get your imagination working and away you go. There's lots more on the website and it would take me ages to list them all here, so please visit and browse around. I want to thank everybody for the fabulous emails you sent me over the holiday period, and for all the good wishes and blessings I have recieved. And a special thank you to the lovely people that send me the photographs of the creations they have made. They are all wonderful. Keep them coming please, it is wonderful to get them. It is encouraging to know that you keep visiting the website and that you are enjoying what you see. I hope to add more and more interesting projects for you to try, and don't forget I would love to see the photographs of all your work. Tell me the story behind your creations and have your own page on the website.